Never heard of Uniqlo? Chances are you will in the next year. And it's not the only new brand that could make a splash in 2012. They aren't household names now, but experts say to keep an eye on these seven emerging retailers with hot store concepts that are ripe for expansion. They could soon be headed to a mall near you. Japanese retailer Uniqlo has set out to make utilitarian clothing -- with features like milk protein softening fibers -- cool, whether you're 16 or 60. Uniqlo's concept is sort of like an Apple Store (AAPL) for fashion; it showcases affordable apparel in a modernist setting, with items like $12.90 camisoles featuring Heattech, its exclusive heat-retaining and moisture-resistant technology. 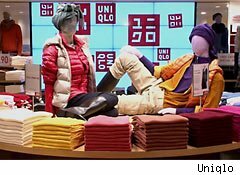 Showcasing high-performance, stylish clothing in a sleek setting is how Uniqlo hopes to "revolutionize" mass retailing in the U.S., Shin Odake, CEO of Uniqlo USA, told DailyFinance during a tour of its new 64,000-square foot outlet in New York City. "Think American Apparel, but done a little better." That describes Joe Fresh, according to Craig Johnson, CEO of retail consultancy Customer Growth Partners. The Canadian retailer is expanding in the U.S., and is on a mission to "solve the family's fashion needs," with an affordable range of "accessible, of the moment style," for women, men and children, as well as beauty products, says the Joe Fresh Facebook page. Adds Joe Feldman, managing director of retail consultancy Telsey Advisory Group: "Joe Fresh is the new kid on the block in the fast-fashion space. It has a clean look and attractive pricing." Watch out H&M, Mango and Zara: The British are coming. U.K. retailer Topshop is quietly making a mark on the U.S. retail scene, bringing its twist on fast-fashion to the States. The retailer is "an upscale -- but not luxury -- fashion-driven business which imports tremendous fashion and shoe merchandise from the U.K.," Gilbert Harrison, founder and chairman of Financo, the boutique investment firm, tells DailyFinance. Now the chain is expanding in the U.S. and Canada. The retailer opened in-store boutiques in 14 of Nordstrom's department stores in September. But while Topshop's merchandise is edgy in the fast-fashion tradition, "It appeals to a broader swath of customers than either Zara or Mango, and is a little higher priced, but better quality, than H&M," for example, Johnson says. GAP) might be struggling, but it's online division Piperlime has been a bright spot for the retailer. Unlike the mother chain that sells clothing exclusively under the Gap brand, Piperlime features apparel, shoes, handbags and accessories from a host of fashion brands, ranging from 7 For All Mankind and Calvin Klein, to Anne Klein, BCBG, Badgley Mischka and Kenneth Cole to Naturalizer and Nine West. Piperlime also plays the role of your personal stylist. The site features guest editors like stylist Rachel Zoe, who dispense fashion advice and offer their picks of hot trends and products available on the site. The retailer expanded with the addition of men's clothing this fall. Glenn Murphy, Gap's CEO, has said the retailer is a growth vehicle for the chain. And there are whispers that Gap might open Piperlime stores. Charming Charlie sells affordably priced earrings, necklaces, bracelets, handbags, scarves and belts for women of all ages in a variety of looks, from vintage, modern, glamorous and global fare to bohemian and punk rocker-inspired styles. Named "hot retailer of the year" by the International Council of Shopping Centers in 2010, it's reminiscent of Claire's, the teen accessories chain, but for a broader audience, Johnson says. And it's "very hot and expanding right now."